Rebecca Anderson, a student in the Driskill Graduate Program in Life Sciences, uses zebrafish to study bone development to better understand skeletal dysplasia. Rebecca Anderson, a student in the Driskill Graduate Program in Life Sciences, received the Children’s Research Fund Outstanding Graduate Student Award in recognition of her research that uses zebrafish to study bone development to better understand skeletal dysplasia, as well as her teaching and mentoring activities. The award consists of $5000 for research-related supplies and is funded by the Children’s Research Fund Board, affiliated with the Ann & Robert H. Lurie Children’s Hospital of Chicago. Anderson studies a spontaneous mutation that results in enhanced ossification, or bone formation, in zebrafish in the lab of Jacek Topczewski, PhD, research associate professor in Pediatrics-Developmental Biology and director of Stanley Manne Children’s Research Institute Fish Facility. Skeletal dysplasia encompasses 175 different types of skeletal abnormalities, often resulting from mutated genes, which can be inherited or sporadic. 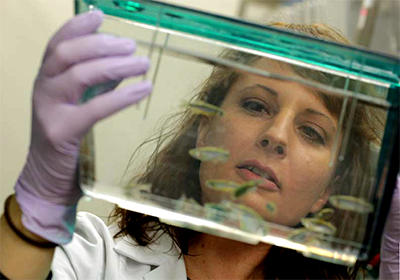 Anderson’s research characterizes the bones in a mutant zebrafish line to uncover information about the genes that cause the abnormal phenotype. In preliminary research, she has found a mutated regulatory element that she thinks may affect a gene playing a key role in bone development.